Hello! 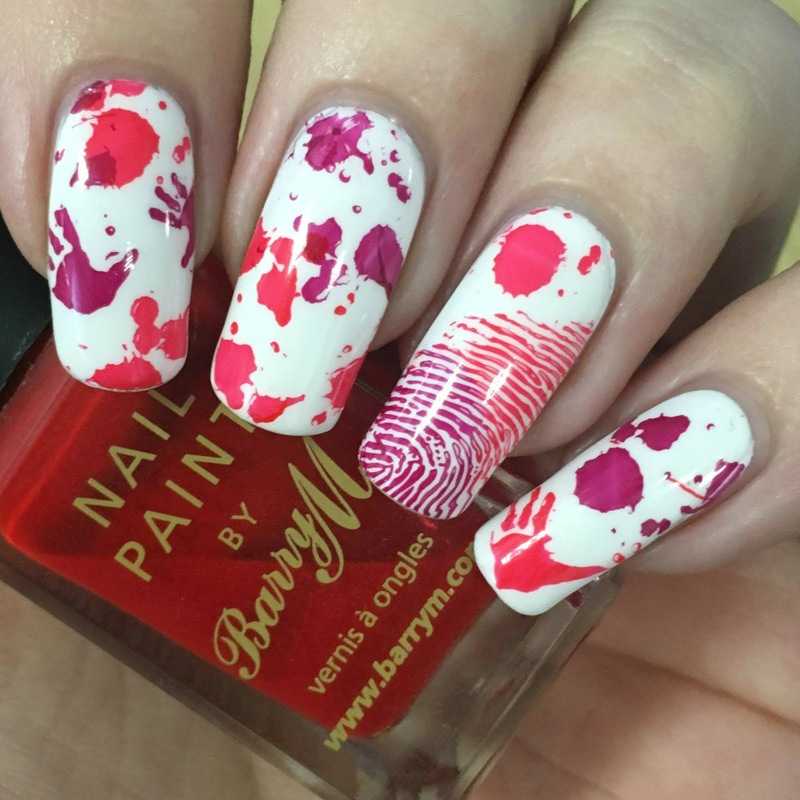 Today I'm back with another Halloween design for you, this time a fun blood splatter look using all Barry M polishes. I did a similar look back in August 2015 for a murder mystery dinner (post here), and I loved it so much I had to recreate an updated version. My original mani was done with straws and my own fingerprints, but this time I've gone for some stamping. Read on to find out more! I began by painting my nails with Barry M 'Matt White'. This has to be the oldest white polish in my collection and I still reach for it quite often. The formula is smooth and easy to apply. It is streaky on the first coat, but evens out nicely in two. I'm quite picky with whites, so I do tend to add a third just incase. Below is three coats and topcoat. I pulled out my stamping plates, and found both a fingerprint and splatter image on Moyra Labyrinth plate, and handprints on hehe plate 057. I had a play with all three images on my mini Uberchic mat, using my Born Pretty Store clear stamper and scraper, and Barry M 'Bright Red' and 'Raspberry'. Happy with how it looked, I then stamped onto my nails. I used a random variation of the designs and polishes. I left the polish to dry for a few minutes before topcoating to seal everything in. What do you think? I'm not 100% sure on the colours this time around. It's the same polishes I used in my previous mani, yet doesn't quite look the same. It looks great in dim lighting, but looks pink and purple in brighter lights - woops! I still love it though! 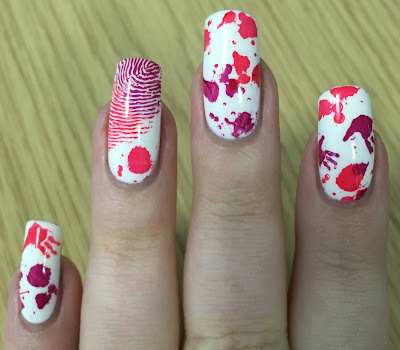 I want to try and sneak in the splatter pattern with different colours throughout the year. Let's see if I can get away with it. I am loving everything about these! It would be cool to do something similar with a glow in the dark polish too. So it is kind of blended in until you're in the dark. This mani is so perfect! I love the fingerprint! These are so perfect! 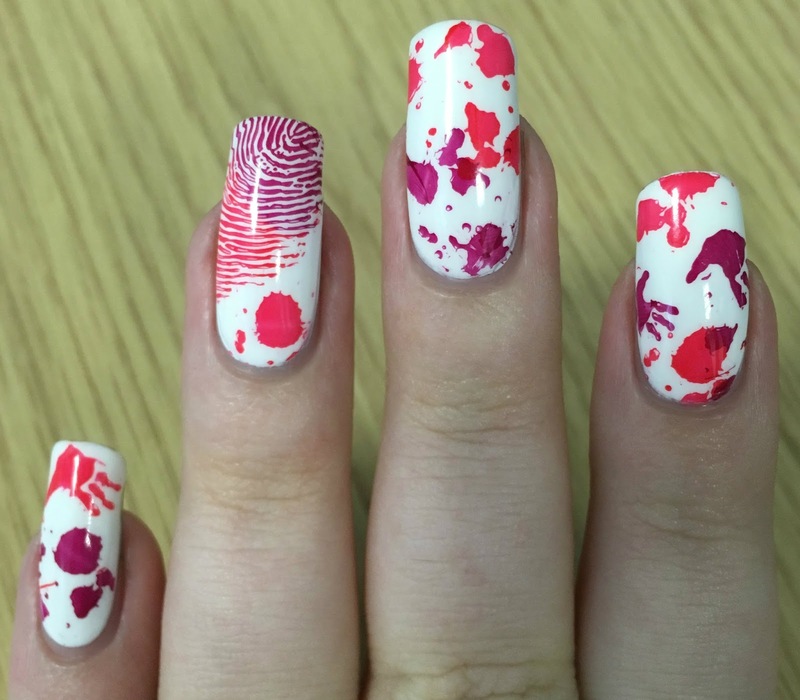 The fingerprint looks fab! Amazing mani... The hand prints and the fingerprints look so perfect!!! I am sure about these color, they really make this mani pop! Amazing job!